As humans have developed cities and built environments, we have also needed to develop ways to find our way through them. Signage goes back at least as far as the Roman Empire where they constructed "milestones" along their roadways. A Roman milestone in modern-day Portugal. Credit: Julia Reis. Today, signage and other cues to help you find your way come from the field of environmental graphic design, or "wayfinding." 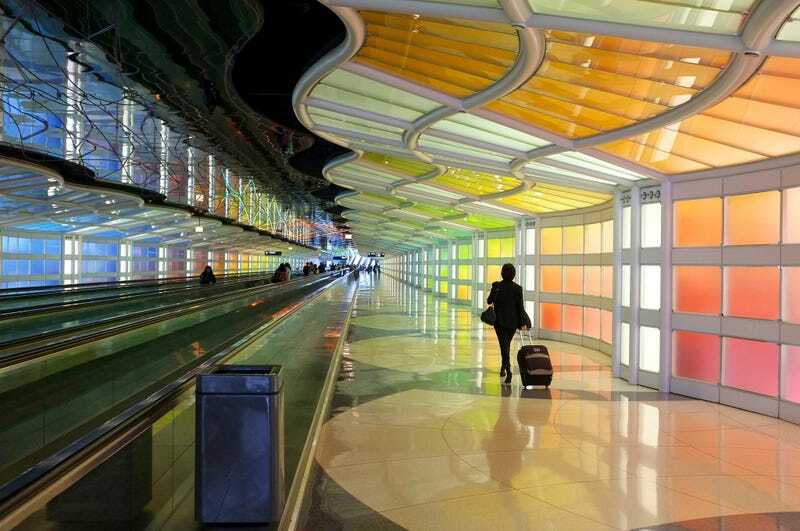 Chances are that any signs in an airport, in a hospital, or on a freeway, were created by professional wayfinders. But there's more to wayfinding than signage. In fact, signage is the least effective tool of wayfinding. Good architecture is among the best. The terminal maximizes "sight line," because if you can see your destination, you don't need signs. Image © Chris Cunningham Photograph. Courtesy of Gresham, Smith, and Partners. There's another set of tiles inside the dominant grid pattern: a "yellow brick road" that cleaves out this corridor out of negative space going directly towards security. Credit: Gresham, Smith, and Partners. Not all airports are this streamlined and minimal, however. Often, as a traveler, you'll have to find your way as you're being bombarded with all sorts of images that compete with the wayfinding. And so the key here is to make the signage stand out by being drab and plain, so you can tune out all the glitz. However,wayfinding and commerce aren't necessarily in competition. In fact, often it's the case that an airport's wayfinding is there to give you a sense of calm as you navigate an unfamiliar environment with the hopes that, in that mindset, you'll be more likely to buy stuff than if you were stressed and in a hurry. And sometimes, wayfinding will steer you towards opportunities for you to spend money. In theory, wayfinding should work whether you're literate in it or not, but learning to see the subtle wayfinding queues in the built landscape can help you understand how you make your decisions. It can also make you question if you're the one even making your own decisions at all. Outside a food court in the Atlanta airport, this tiling steers pedestrian flow. Credit: Sam Greenspan. 99% Invisible producer Sam Greenspan met wayfinding expert Jim Harding at the Hartsfield-Jackson International Airport in Atlanta, Georgia. Jim is the Director of Environmental Graphics for Gresham, Smith and Partners, and co-author of a massive document full of everything you'd ever want to know about airport wayfinding.